This screenshot. I love this screenshot. This is a paused frame during a combat between computer-controlled AIs. The far aircraft has just avoided a missile from a third aircraft (not visible here) and is firing at an enemy. The enemy went down in the very next frame. You may remember this as the aircraft game that I have been making for so long (latest update way back). So, I had put off this game for quite a while for the sake of other projects, and for the last 3 months I had quit gamedev'ing altogether. I only recently missed it and came back. Did the very annoying and soul-draining job of updating the project to the latest Unity version. It was left at version 4.3. Evolved the AI. AI aircraft can now dodge missiles and use flares. 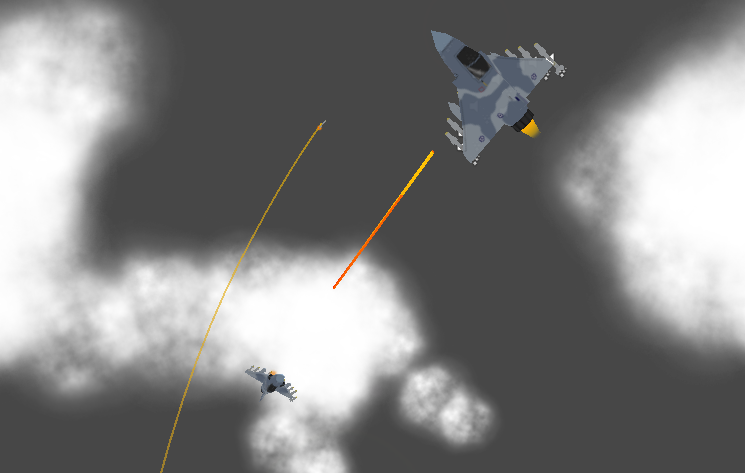 (Oh yeah, since the last update, I had also added missiles and flares in the game). Incorporated large-scale battles by testing and tweaking for battles with bigger numbers of aircraft, and respawning aircraft. When you died, you had to restart and go over the boring "fly until you meet the enemy" process again. Battles often ended up with you and a foe left, chasing each other around in circles. Next up in the todo list is, among other things, adding more aircraft types. 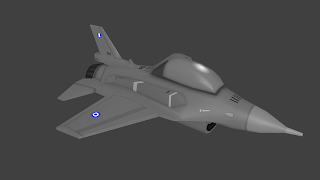 F-16 is coming right up (This is an in-progress screenshot. Looks too gray. I know). That's all for now. Lots of work to be done.